Last weekend I was excited to get the chance to see my first UC Follies show. 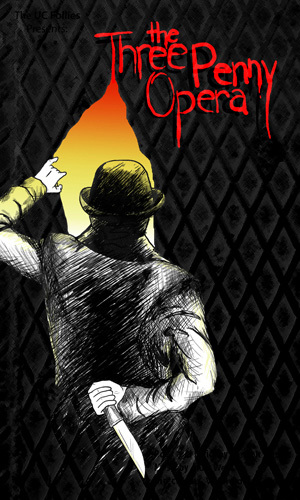 The Threepenny Opera was in the lovely Hart House theatre, featured some excellent performers and had some good moments, but the overall production was shaky at best. The unforgiving score from Kurt Weill and dark lyrics by Bertolt Brecht made the play, well, Brechtian, in the impossible-to-pull-off-not-to-mention-understand sense, an obstacle the underwhelming pit band was unable to overcome. The singers struggled too, prompting celebration whenever something sounded really great, because it didn’t happen as often as you’d like. While set designer Courtney Cathers made good use of space, director Viridi Odern used an annoyingly heavy hand, forcing low brow comedy at moments that didn’t need it. Lighting and costume design by Travis LaHay and Heather Carlson respectively were decent but Shakir Haq’s choreography proved too difficult for the cast (most of whom, I’d venture a guess, were not dancers), they bumbled inexpertly through the steps when most scenes would have been just fine without any dance at all. As for the cast, they were a mixed bag (as student casts generally are). Tim Ziegler warbled his way through his songs but provided excellent sardonic commentary as the Radio Broadcaster. Nicole Stawikowski’s Polly suffered from the heavy directorial hand and came out purposefully/annoyingly ingenuey while her classical soprano voice was outmatched by both the demanding score and the weight of her costars’ stronger sounds. Alicia Kapudag gave a roller coaster of a performance as Mrs. Peachum, creating interesting, detailed character moments then slashing them to bits with overacting. She was lively to be sure, sometimes a breath of fresh air in a dreary production, but she walked the fine line between refreshing and grating more than is comfortable. Most of the ensemble was decent, though Deborah Lim’s barely-clad Dolly proved endlessly irritating. The cast did have some redeeming members. Sarah Thorpe gave easily the best performance I’ve seen from her as Low-Dive Jenny. Her expressive voice could have used a microphone (as could many of them) but hers was the most convincing character performance of the lot and I easily invested in her story. Louisa Zhu was a nice surprise as Lucy Brown. The feisty singer delivered strong vocals and her mature performance was quite effective. Will Horstetter was also pretty good as Tiger Brown, though the occasional broad choice slowed him down a bit. But ultimately the story of The Threepenny Opera belongs to Mac the Knife, and in a tough-to-love production it’s therefore lucky that The UC Follies cast Michael-David Blostein as their Mac. The My Theatre Award nominee was predictably good in a role that utilized his excellent bass, quirky demeanor and penchant for playing charismatic psychopaths. It was a standard effective Blostein performance, until his final monologue before Mac is dragged off to be executed. That was the first moment in a long time that I’ve seen something really different from him the familiar performer. That speech was quiet, subtle and layered, a call for Toronto directors to start seeing this guy as more than a singer with acting presence but as someone who could take on something like a Shakespearean lead and hit it out of the park. Blostein’s weak point, however, appears to be chemistry, something that The Threepenny Opera lacked in general; he and Sarah Thorpe (and almost all the other women) came close but lacked the indefinable sizzle that the scenes needed. As a whole, The Threepenny Opera was pretty rough. The challenging and somewhat off-putting book, lyrics and score leave little room for forgiveness when it comes to cast and director interpretation and talent. For the most part, The UC Follies weren’t quite up to the task, but those who were certainly put on a good show.